Proof reading is a necessary chore in this world of ours. Personally, I get so frustrated when I've created a flyer, brochure, power point presentation, newsletter, blog post, etc... only to find a typo after publication! Argh! I even proof my own work. One of my most embarrassing typos: Before the days of computers, I had to send a memo to a regional manager (working for Marriott Hotels and Resorts in Seattle, WA at the time). It was all about an imbalance in our inventory of men's dress shirts. Dutifully, I sent off the memo and filed away my copy for future reference. About a year later, as I was purging old files prior to being transferred to another hotel, I came across this memo. Words can not describe how mortified I felt, I'm telling you MORTIFIED, to see I had left the r out of shirt! This past Saturday as I was cleaning and organizing the pantry cupboard I came across this.....My most favorite typo! 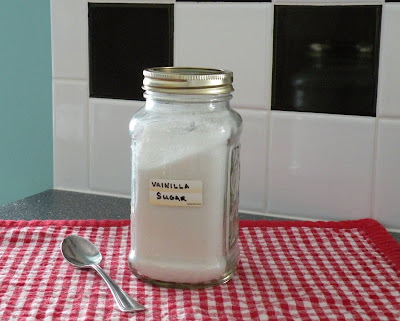 My sweet Mother printed this label for a bottle of Vanilla Sugar she gave to me. It prompts a smile each time I see it! Ruth - I had no idea you had a blog - What a funny story about the typo. You are such a cutie! !